SITOP compact was developed to be an extremely spacesaving power supply for the lower power range. It is especially suited to distributed applications in control boxes and in small control cabinets. Its high efficiency over the entire load range and low no-load loss make it exceptionally efficient. It is ideal for applications that are often in standby mode. The miniature power supply units in the LOGO!Power series can be deployed in a large number of applications in the lower power range. Their extreme flexibility is made possible by the units’ diverse output voltages, wide input voltage range with optional DC operation, and flat, stepped profile for installation in distribution boards. SITOP lite is the power supply series for basic requirements in the industrial environment, offering all the important functions at a low cost – without compromising quality and reliability. The wide-range input with manual switchover supports connection to a wide range of singlephase supply systems. SITOP smart is the optimal power supply for many 24 V and 12 V applications, featuring compact design, powerful performance, and low price. Despite its compact size, it offers outstanding overload characteristics thanks to the extra power feature that provides 1.5 times the rated current for five seconds: Even large loads can be easily switched on. And with a rated capacity of 120 percent, these slim power supplies are among the most reliable of their kind. SITOP modular provides maximum functionality for use in complex plants and machines. Its wide-range input allows it to be connected to any supply system in the world and also guarantees a high level of safety, even in the event of large voltage fluctuations. The power boost briefly delivers up to three times the rated current: and in the case of an overload, you can choose between constant current with automatic restart or latching shutdown. This unit’s high efficiency keeps the energy consumption and heat development in the control cabinet down to a low level, and the compact metal enclosure also saves space. The innovative SITOP PSU8600 power supply system can also be fully integrated into networked automation applications and the TIA Portal, and enables entirely new parameterization and diagnostic options. 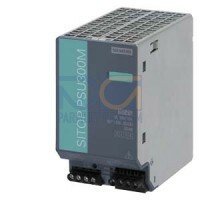 The design and functionality of the original SIMATIC power supplies merge into the SPS network. Together with the SIMATIC systems S7-300, S7-1200, S7-1500, and the distributed I/O modules ET 200pro, ET 200M, and ET 200MP they also supply other loads reliably with 24 V.
Restricted installation conditions, harsh environmental conditions, or special input and output voltages: these standard power supplies meet even exceptional requirements. For example: low-cost 12 V and 24 V power supply units in rugged aluminum enclosures for direct wall mounting in various installation positions and power supplies in protection mode IP67. Or power supplies with special functions like battery charging and flexibly adjustable output voltage.